The Cubbie Sensory Unit (New Frontiers alumnus, David McIntyre) was featured on TG4’s Prime Time news. The prototype has been installed in Scoil Daire across from the GMIT Galway campus. View the coverage at 11 min 23 secs. Tweet-Eye is a digital marketing tool that helps connect sellers to potential buyers on social media. Co-founder, Barbara Heneghan, was interviewed about her startup by siliconrepublic.com. Congratulations to Barry Flannery (Xerotech) and Mark Corrigan (Marine Cable Services) on winning first place and runner-up respectively at the recent Best Emerging Business Awards at GMIT. The One to Watch Award went to Iain Morrow of Open Box Models. Marc Ganly is a New Frontiers alumnus and co-founder of Contego Sports. The head guard startup has recently raised €1.5 million in funding and was featured in the Sunday Business Post. 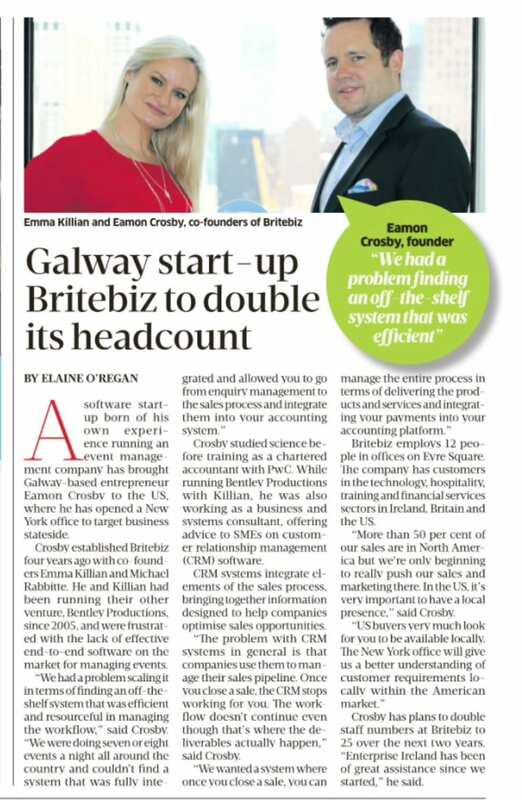 Another startup to have received support from New Frontiers – Britebiz – is featured in the Sunday Business Post. With over 50% of their sales in the USA, the startup has just opened a New York office. VT Networks, founded by New Frontiers alumnus Mark Bannon, is named in Silicon Republic’s roundup of the most important players in Ireland’s IoT (Internet of Things) ecosystem. See the full list. Contego Sports founders, Mark and Sandra Ganly, were on Sky News with Alex Corbisiero talking about the innovative N-Pro rugby cap. You can watch the interview here. New Frontiers startup, Spotrack – the innovative system that turns moving lights into followspots – is currently a key element of the lighting design for the Donmar Warehouse’s Shakespeare Trilogy in London. Spotrack will also be on show at LDI in Las Vegas from October 21st to 23rd. Sorcha O’Grady and Jens Hellberg are the co-founders of TruckScience, based in Westport. The company develops professional software for the trucking industry worldwide and was recently featured on mayonews.ie. DiaNia Technologies – founded by New Frontiers alumna, Sinead Kenny – is set to create 20 new jobs after raising €2 million in seed funding to develop specialised materials for catheter-based medical devices. Read the story on irishtimes.com.